“You wake up one morning…and decide that how you’ve been in the past doesn’t have to define who you are in the future.” In the book, Tangled written by Carolyn Mackler four different teenagers shared no significant connection with each other until one vacation changed their lives forever. Jena is a shy and completely ordinary girl, but that was soon to change. After the death of his girlfriend Natalie, an average eighteen year old boy, Dakota, experienced guilt which led him off the rails and it took one trip to realize the importance of living his life instead of wasting it. Skye was “one of those rich, privileged New York City kids that the rest of the world loves to hate.” Any girl would dream of becoming Skye but who knew that Skye wouldn’t want the life that was given to her. Finally there is Owen, who never takes risks and hides behind his computer all day, is given the opportunity to take a leap and escape his online life. That leap changed Owen and he grew from being mother’s favorite little boy, to an independent young adult. Jena, Dakota, Skye, and Owen’s lives all became tangled up at Paradise resort in the Caribbean but what they didn’t know was how much of an effect each person would have on the other. Carolyn Mackler wrote a decent novel, but it was not as great as her previous book, Infinite in Between. This is because, all the teenagers in Infinite in Between connected through major events in contrast to Tangled, where the characters only connected through tiny details. For example, Skye and Owen were associated with each other only because Owen’s brother, Dakota, brought Skye to see a phosphorescent bay in the Caribbean. However, on that day Owen faked a stomachache so he wouldn’t have to embarrass himself in front of the movie star. The book was laid out in four stories, four months, and each teenager had a month to tell their story. I wish the stories included more twists and turns that would keep the reader interested because I became disinterested throughout most of the narratives. Another month where all the teenagers came together together iwould have created a more effective and interesting ending instead of concluding the novel with Owen’s story. This is because the teenagers possibly would have discovered more secrets that connected them and tangled them up together even more. 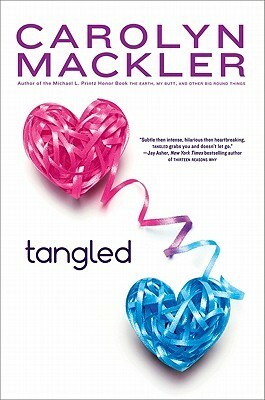 This book did not grab me in and keep me wanting for more, therefore Tangled is not recommended.